Location: Chareil-Cintrat, in the Allier departement of France (Auvergne Region). Ownership / Access: Now managed by the centre for national monuments. 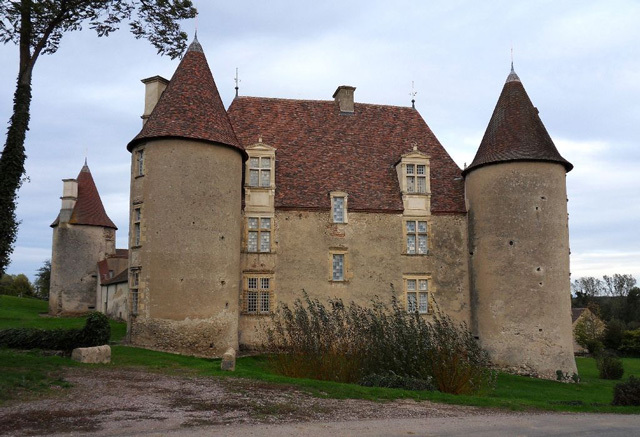 Notes: Château de Chareil-Cintrat is a castle dating from the late sixteenth century, in the town of Chareil-Cintrat in the Allier. After an initial registration in 1930, the castle (gardens and soil included) is the subject of a classification as historical monuments since November 3 19581. It is now managed by the National Monuments Centre. The castle belonged to the mid-sixteenth century to Claude Morin, Controller ordinary wars, that he made the decorations painted mythological and astrological themes inspired by the antique. From 1752, the Langlois family has Ramentière2 the castle; Louis Jean Pierre Langlois Ramentière is the first mayor of Chareil. After the death of his son Claude in April 1815, the heirs sold the castle to the Tuna family. The state purchased Chareil in 1958.